With the holidays quickly approaching, you may already be preparing for the numerous guests you plan on entertaining in your home. Between Thanksgiving and the winter holidays, there are many opportunities to gather your friends and family in one place to celebrate each other’s company. That being said, with so many people in one place, you may be worried about your plumbing and septic system. 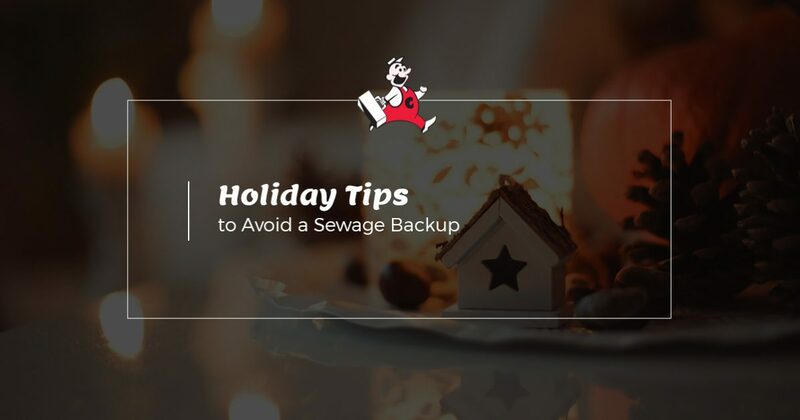 In order to avoid any clogs or costly repairs that will surely ruin the holiday spirit, we’ve put together a few tips that will give you peace of mind that your system is functioning properly. To learn more or to schedule an appointment, contact the experts at Coker Septic in Florida for all of your septic tank maintenance and repairs. Your garbage disposal is a great tool when you want to avoid old food smelling up your entire kitchen. However, many people don’t know what is and isn’t safe to put in the garbage disposal, and the wrong items can cause problems for your disposal. For example, if you put grease down your garbage disposal, it can form a clog in your system. Additionally, bones from your holiday turkey are too dense and difficult to break down, so it’s best to simply throw them in the trash. 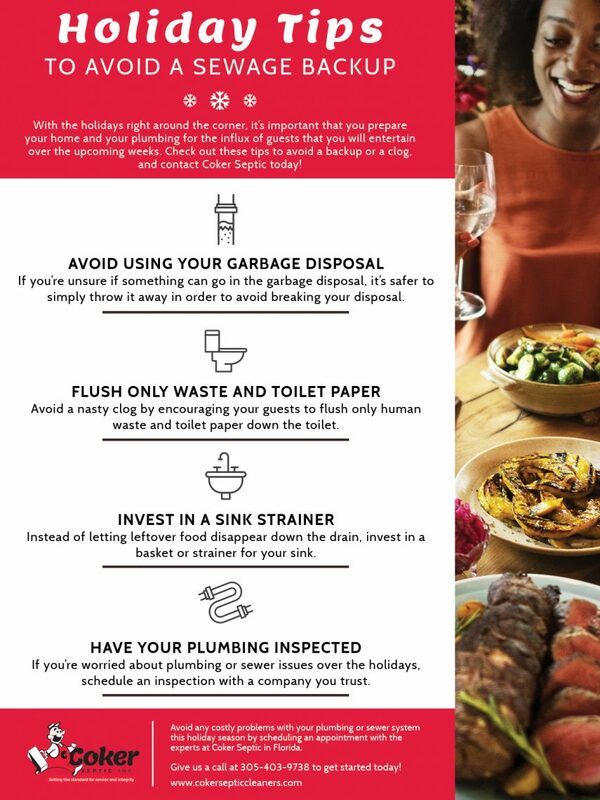 If you want to avoid plumbing problems this holiday season, it’s best to avoid the garbage disposal and throw all of your food scraps in the trash. Items that aren’t biodegradable can easily cause a clog in your toilet and a backup in your septic tank. This is easy enough to control when the only people using your toilets are members of your family, but when you have numerous guests visiting your home, they may not have the same expectations. 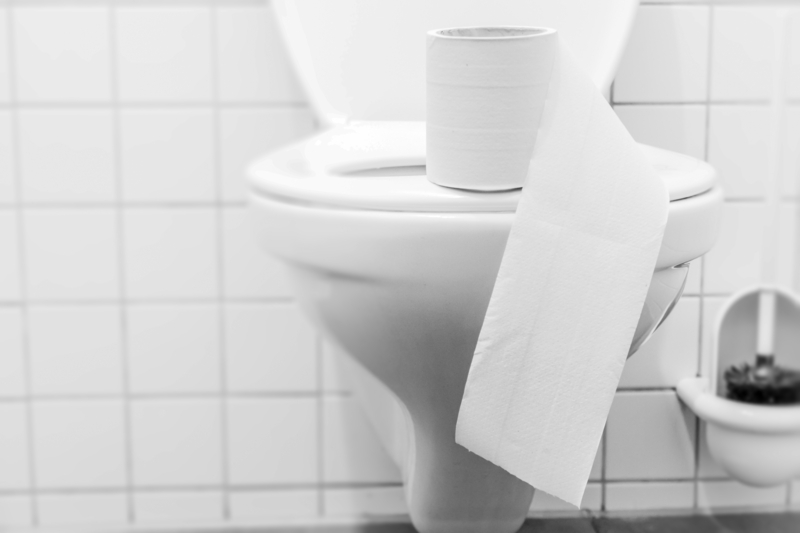 It’s a good idea to encourage your guests to flush toilet paper and human waste when they use your bathroom in order to avoid unnecessary clogs or backups. If you tend to throw your dishes in the sink and wash them without disposing of any leftover food scraps, you may not notice all of the food that disappears down your drain. That being said, the food that goes down your drain could form a clog in your pipes and cause your sink to drain slower than usual. For this reason, you may want to invest in a sink basket or strainer that will catch the food as the water drains, allowing you to avoid any costly clogs. Prior to your holiday parties, take some time to inspect the way your sinks and toilets drain. Do they drain the same way they always have, or are they taking longer than usual? If you notice that your drains are taking longer, or you simply want to have peace of mind that your festivities won’t be interrupted by an overflowing toilet or sink, call the professionals at Coker Septic. In addition to offering septic tank maintenance and repairs, we also specialize in residential plumbing. As a Top Rated Local® septic cleaner in Florida, we can provide you with expert assistance 24 hours a day, seven days a week. Don’t wait until you have a problem — give us a call today!